Talk’N’Roll – what’s a geek? On Tuesday, September 26, the Manggha museum in Kraków hosted the Talk’N’Roll conference – an exceptional event created by geeks and for geeks. Thirteen speakers delivered answers to questions that we don’t usually spend a lot of time on. Was Nicholas Tesla a geek, and just what exactly are geeks? Will flights to Mars be commonplace in 100 years’ time, or will we still keep getting stuck in traffic? How will the engagement of geeks translate into projects that help to improve society? How will artificial intelligence change the future? Geeks are presently regarded as fanatics divorced from reality and experts in new technologies. The organizers of the conference set for themselves the goal of countering the myth of the IT specialist glued to a monitor. They decided to demonstrate that programming, computer science and advanced technologies can provide inspiration for creating interesting and ambitious projects that go far beyond the borders of those fields. 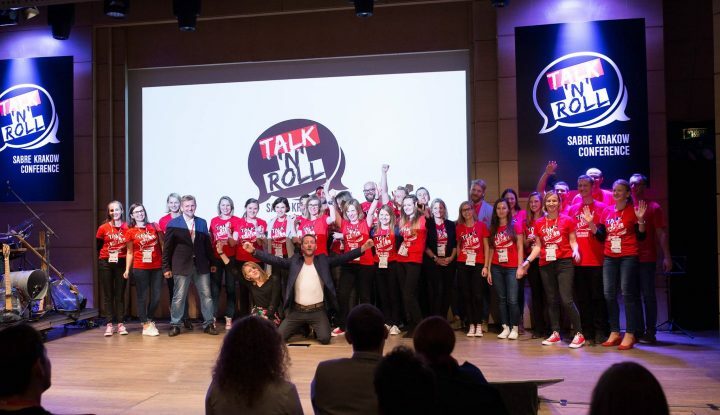 The third edition of the Talk’N’Roll conference was the first to be open to the general public. Interest in the event far exceeded the organizers’ expectations. Tickets were sold out two weeks in advance, and dozens of people put their names on a reserve list. Ultimately, around 250 participants took part. 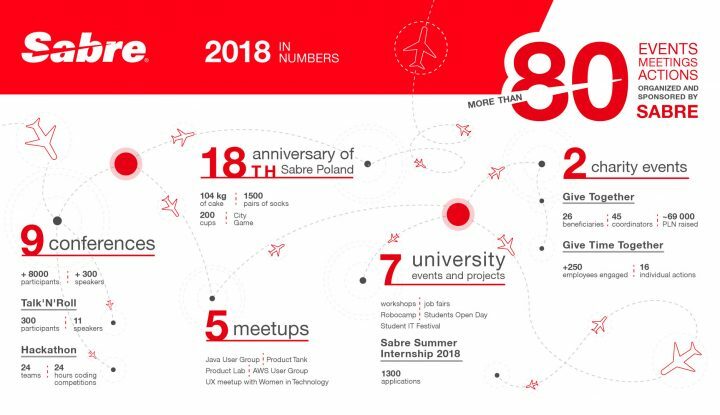 Each of the three editions of Talk’N’Roll were developed and organized by employees of Sabre Polska, gathered in a community of the same name. 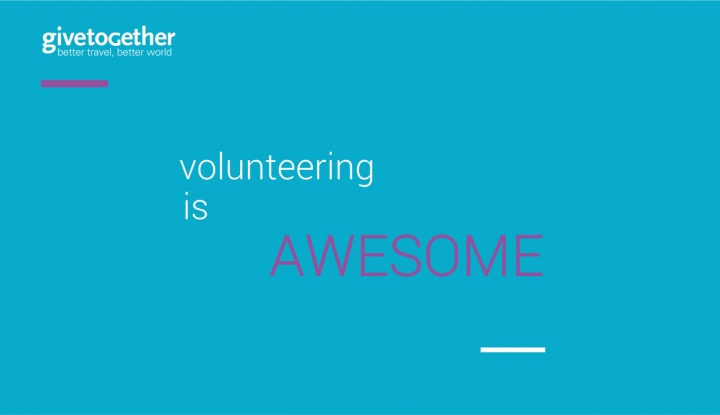 This community is home to around 30 people who work as programmers, QA specialists, project managers, and administrative specialists. 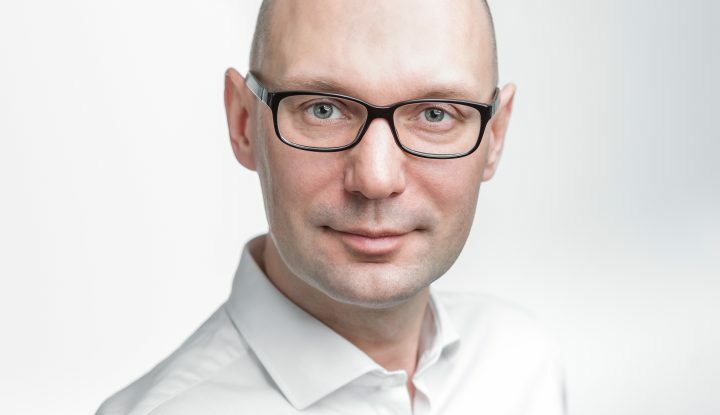 The primary organizer, coordinator, originator, and this year speaker as well, is Michał Winkler, Senior Software Development Manager in the Customer Profiles department. The gathered guests listened to presentations delivered by experts in a range of fields. During the first session, Piotr Prokopowicz spoke about managing the “millennials” generation, Pramod Jain talked about traveling through the world of IT, and Anna and Maciej Ryś discussed their efforts to save the world through their SMOGATHON initiative. The second session was opened by Oskar Skibski, who talked about why his work consists in connecting dots, and what results from it. Michał Winkler discussed transport of the future. The panel was concluded with a presentation by a special guest – Robert Korzeniowski, who shared the story of his march through life, how he found motivation in the failures and challenges he has faced. The third session began with the subject of conflicts in the workplace, presented by Katarzyna Jurczak. Next, Dawid Ostręga demonstrated that geeks can even succeed in sport. At the end of the panel, Julio Cesar Fort addressed the subject of the militarization of cyberspace, something which impacts all of us. The first speech of the last session was devoted to the most important thing in the world, which in Marian Mróz’s opinion is time. This was followed by Daniel Slavetski, who discussed the interaction of humans with artificial intelligence. The conference was closed by Sindhuja Sankaran, who talked about understanding modern society. Performances by outstanding musicians provided an extra shine to the event. The percussionist Kuba Wolanin demonstrated his skills on the handpan, an exceptionally original instrument made of two semi-spheres. The day replete with inspiration was concluded with a performance by Recycling Band, a group that makes music on instruments forged from used objects, empty bottles, or parts of bicycles. Talk’N’Roll was also available to remote participants. A live stream of the entire event was available on YouTube, which now hosts the official Polish Sabre channel. Check more detailed info at the conference website and be up to date with all news on Facebook.